And now what? The holy compromise is here. Of course there are the usual objections, Lithuania said no more money for Greece, no more Greece in the Eurozone, but Lithuania is not in the Eurozone and a tiny bark from Germany was enough to sign everything laid in front of them. There were also some no in the Greek parliament including ones from the Nazis. A couple from the governing party. Some more said present, refusing to say yes or no. this compromise brought measures. Tough measures. The new measures promise only more austerity, more unemployment and more homeless. The new measures will give only blood and tears. No growth. What’s the alternative? Blood and tears. The banks are closed for more than a week under the orders of the European Central Bank. Nothing moves this last week in Greece and they have made sure that all Greeks saw a glimpse of what is coming if they refuse to stay in Eurozone in their terms. This is the future if Greece insists talking about ending the austerity that drowns the country and the people, that’s what they said. What’s the profit? Of course money. Greece will continue borrowing money with inhuman interest from partners, friends and allies to repay loans impossible to ever pay. The Greek people are sacrificed for the good of the banks and the cooperatives. I have no doubt that the Greek prime minster tried. And the Greek people tried but money won. Now we all now, you can never play honest chess at a black jack table with all the cards marked. He tried. Even using a referendum he tried. it didn’t matter. The banks remained closed, no food - no petrol, the people are hungry. In the end of 2014 the unemployed in Greece were 1,500,000, 27% of the total labour force. How many are they going to be at the end of 2006? Poverty had reached 3,000,000 people, how many are going to be by the end of 2016? 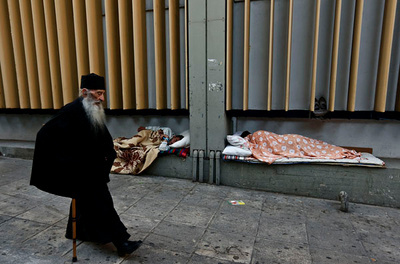 10,000 homeless only in the city of Plato and Pericles; how many in the end of 2016? Who can you blame? Yourself? You should have never borrowed money you could never payback, you say. True, I borrowed 125 billion euros, mainly to buy your tanks, frigates and airplanes but who cares. But why do I have to pay 375 billion after 6 years of your enforced measures ...to save me, money that mainly cover by 70% interests you put on me? For my own good. Reduce pensions, the old people will save the German and the French banks. Increase pensioners participation for health care, who cares they are going to die soon anyway without medicines. 70% unemployment among people under 25. Germany, Belgium and Holland care, they need cheap labour for their industry. They have put adverts everywhere in the Greek media already. And now what? I'm afraid with the Greek compromise, Europe lost something very important. Lost a piece of democracy, lost a piece of credibility, lost her human face. Now it is all about a currency, a coin! Europe exchange democracy, sacrificed more human lives and all that for a damn coin. Indeed Thanos, we are witnessing a real disaster. History teaches us that when men put on paper wonderful ideals and then hypocritically fail to practice them, the consequences are devastating for all concerned. All men are created equal proclaimed the US Constitution but Washington and Jefferson kept their slaves and kicked the can down the road. One hundred and twenty years later the chickens came to roost and there ensued a bloody Civil War. Having learned absolutely nothing from such a tragic event the confederate flag returned to fly on the South Carolina Capitol dome, in contempt of the civil rights movement going on in the late 50s, and we had to wait till yesterday, pursuant to a massacre of nine innocent people in a church, to finally remove it. Pari passu, enter a brand new polity, the EU which proclaimed in the 50s that it would give a more shining example of democracy, promote solidarity not only among its members but also globally. It all looked very good on paper, but then this idealistic polity build on traditional Christian ideals (even if not mentioned directly) miserably failed to practice those ideals and went back to the idols of the economy, real politick and nationalism, ending up with the present Greek financial crisis. If you want to know what people really believe don’t look at what they proclaim on paper, look at their practical actions. It is obvious that bankers’ financial bottom lines are more important within a savage pitiless sort of capitalism; the Pope hit the nail on the head the other day when he talked about it as a scourge for man's humanity. But who is listening? What does he know, say the Christine Lagarde and the Paul Ryans of this brave new entrepreneurial world. The chickens have yet to come home to roost but is the end-game in any doubt? Indeed, those who forget their history are bound to repeat it. And somebody then added to that famous Marxian slogan: and the second time as a farce. Or, as Fellini would say: now bring in the clowns.